How to use the Hueman theme on your website ? The Hueman WordPress theme is free. Installing it takes only a few clicks. The Nimble Builder is a free plugin hosted on wordpress.org. It’s a lightweight section builder intended to be the content creation companion of the Hueman theme. It allows you to drag and drop pre-built sections, or create your own sections, in live preview from the WordPress customizer. See a live example of a page built with Hueman and the Nimble Builder. Where can I get documentation and support for the Hueman theme ? What makes the Hueman WordPress theme unique ? Best rated theme ever for blogs and magazines sites on WordPress.org. Powers 80K+ sites. The Hueman theme has a versatile design. That’s why it is used on very diverse websites like blogs, magazines, small businesses, schools, church or personal websites. It is usually recognized to provide an exceptional experience on mobile devices, to load fast and to be very easy to use. 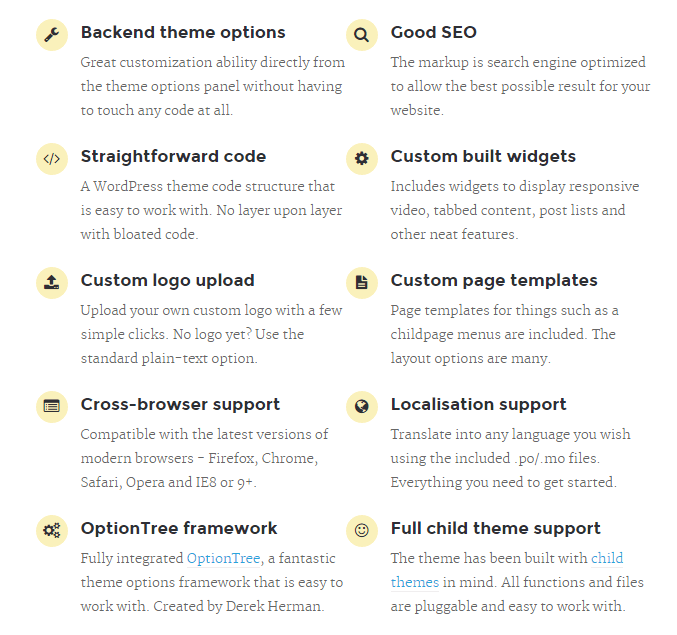 The Hueman theme, with its free addons plugin, includes a unique customization technology allowing you to customize any page of your websites independently from the others, while all theme options set in the customizer are usually applied site wide. In the Hueman theme, the WordPress live customizer has an enhanced interface. For example, if you need to display the left sidebar only in your contact page, you will simply need to pick the options tab for this page, and then navigate to the page layout section, select your sidebar layout, and publish your changes. Learn more about how to customize the Hueman theme here. The Hueman theme has been designed to be intuitive and simple. If you need guidelines, we have published a complete documentation website. What can you do with Hueman WordPress theme ? The Hueman theme is a website template ( also called theme ) developped by Press Customizr (1), that you can use with WordPress (2) to create your website. Like WordPress, it is free and open source ( GPL v3 licensed ). You can check many of the theme’s features live in the Hueman Theme demo. (1) the theme was initially designed by Alexander Agnarsson. (2) If you’re new to WordPress or if you don’t know exactly what a WordPress template ( also called WordPress theme ) is, head over to this page.